The Cape Town to Johannesburg Overland Camping Safari endeavors to show the highlights of the this vast swath of southern Africa, from the dynamic city of Cape Town, to the scorched deserts of Namibia and the wildlife sanctuaries of Botswana and Zimbabwe. On a journey of contrasts, we will canoe the Orange River, climb giant sand dunes, game drive in some of Africa’s best-known parks, and view the mighty Victoria Falls. We cover a great deal of distance on some remote and rough roads and clients must be prepared for this but the natural wonders that we encounter more than compensate for any discomfort – for those who truly seek adventure on the Cape Town to Johannesburg Overland Camping Safari. Our 24-day adventure starts in one of the most iconic cities in South Africa – Cape Town. We meet at the GREENFIRE LODGE CAPE TOWN at 13h00 on day 1 to spend the afternoon exploring and visiting some of the sights. During our time in Cape Town, our guide will take guests to hike up Table Mountain with its breath-taking views over the Atlantic, visit Cape Point and Cape of Good Hope, the famous waterfront and Hout Bay. We also visit a wine farm and various other sights. Our exact program will depend on the weather. We spend both our nights at the GREENFIRE LODGE located in Seapoint. (lunches and dinners are own expense in Cape Town). We leave the Mother City behind us and after one last view of Table Mountain from across the bay, we travel north through the “Swartland” and along the West Coast into Namaqualand, a completely new environment shaped largely by the winds blowing off the cold Benguela current. In the early spring, this usually barren area comes to life with the blooming of numerous desert adapted flower species. The old Bushmen believed the flowers represented the souls of departed springbok. Our route is one of contrast and ever-changing scenery, from wide open spaces to the dramatic rock formations found in the Cederberg. We overnight along the coast and enjoy a homemade meal. 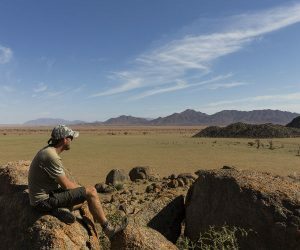 Today we travel north to cross the border into Namibia, known for its dramatic landscapes and beautiful desert vistas. Once through the border, we travel the short distance to our base on the banks of the Orange River at Felix Unite. 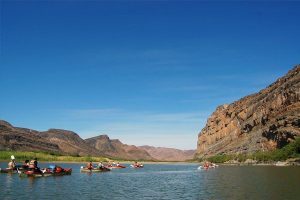 On arrival we pack our gear into 2-man canoes and head for the Orange River, proceeding downstream at a leisurely pace with magic scenery and allow the complete tranquillity to surround and enfold us. The Orange River is the longest river in South Africa, starting in the Eastern Highlands and meandering all the way through the country until it reaches the ocean. Tonight we spend camping on the banks of this mighty river under a canopy of stars, unpolluted skies letting you marvel at the various hues, red, green and blue, only to be interrupted by the dozens of shooting stars you will see. An evening full of magic and stark beauty, giving way to complete awe, a night which you will remember for a long long time to come. Today we head directly to the iconic Fish River Canyon, second only in size to the mighty Grand Canyon. An iconic landmark in Namibia, it is a destination not to be missed and we will spend some time admiring the landscape and visiting the viewpoints. After exploring the lip of the canyon, we continue into the true Namib and will enjoy a picnic lunch on route to our final destination at our private desert game reserve. On arrival in the late afternoon we setup camp at the GREENFIRE DESERT CAMP. The GREENFIRE DESERT CAMP is situated on our private nature reserve within the Namibrand Nature Reserve and is home to numerous species of desert adapted fauna and flora. The camp is spectacularly built against a rock outcrop between the stark mountains and the red dune-fields. During our stay here we will conduct guided walks and drives including a night drive within the reserve allowing us to observe animals at close range. The reserve offers guests a private and secluded desert experience, a day for learning that the desert is not a dead barren wasteland, but a vibrant living thing. An early start, we travel directly to the dune fields of Sossusvlei where we find some of the biggest dunes on earth. We take you to climb the dunes in the morning while the air is still fresh and cool. The last part of our journey to the dunes will be through the thick sand and for this we use an open 4×4 vehicle which will take is into the heart of Sossusvlei and Deadvlei to explore it further on foot. The varied colours of the ever silent dunes at various times of the day, with the utter starkness of the area creates a unique experience. After our extensive dune experience, we continue into the desert where we camp the night. 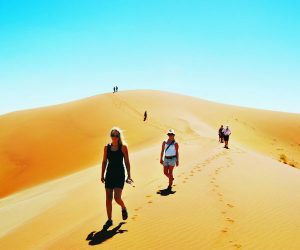 A short journey today, we cross the Kuiseb Canyon and the Naukluft Park toward the seaside town of Swakopmund where we spend two nights at the GREENFIRE LODGE SWAKOPMUND. Established in 1892, the town is rich with history, culture and adventure. Originally built as a trading and fishing port it was later found that the nearby Walvis Bay was a more suitable location. Today the town is a visitor’s paradise with various local restaurants, shops and a multitude of activities available. We have a full day here for exploring the town and partaking in some adventure activities. The GREENFIRE LODGE SWAKOPMUND provides the ideal location for exploring the town of Swakopmund with its beaches, markets, curio shops and huge variety of adventure options that include quad biking, sky diving, horse riding, dune boarding, and much more. The nightlife of Swakopmund is also worth experiencing. On both nights here, we enjoy a restaurant meal getting the most out of the town and all it has to offer (at own expense). Today we head north up the Skeleton Coast, a barren stretch of coastline with scattered ship wrecks along the Atlantic Ocean. We visit Cape Cross, where the Portuguese explorer Diogo Cão arrived in the Jan of 1486, planted a Padraô, and declared the surrounding lands to fall under King Joan 11 of Portugal. It is also home to thousands of Cape Fur Seals. We venture back inland and travel through the desert to visit the towering granite peaks found at Spitzkoppe. After exploring the outcrops in the afternoon, we set up camp and enjoy the play of the light during sunset from our seat in the mountain. We spend the night at the foot of the mountain. Beginning our Wildlife Adventure, we enter into The Etosha National Park, the home to a myriad of animals that have adapted, and thrive in this arid environment. Upon arrival, we set up camp and then depart on an extensive afternoon Game Drive. We return to camp to enjoy a sundowner or two at the flood lit water hole, watching nocturnal drinking habits and pecking orders of the thirsty animals, only to retire after a tiring but satisfying day. Continuing through the reserve on a full day game drive within the park and onward to our next overnight stop in the park. Our guide will take time to explain more about the sights and sounds that surround us. We will use the campsites in the park on both nights. After a short game drive, we leave the harshness of the area, and head for the lush lands of the Caprivi. The Caprivi got its name from the German Chancellor Leo von Caprivi who negotiated the land acquisition from the UK in order to gain access to the Zambezi River. From the park we will cover some distance and will travel through many villages and towns, giving us a glimpse into the daily lives of the local people. Tonight we camp on the banks of the mighty Okavango River in relative comfort. 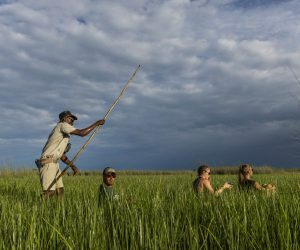 It is with great excitement that we cross the border into Botswana and make our way towards the Okavango Delta, a massive inland delta that creates a true wilderness. We begin our journey into the delta near the panhandle, gliding through the papyrus lined channels by motorboat to our exclusive wild island. We spend two nights here in true wilderness, exploring the area on foot and by mekoro, a hand-chiselled canoe by the local people out of a tree trunk. There will also be time to simply relax and absorb the remoteness and serenity of the area. Clients will not only learn more about the animals and plants from the local guides but will also interact and have the opportunity to learn more about the people and their way of life in this isolated wilderness area. This morning we enjoy a motorboat transfer across the panhandle and back to our vehicle. Traveling through the Kalahari, we make our way to Maun and on to the DRIFTERS MAUN LODGE where we will have time to relax after our day of traveling. We enjoy a relaxed morning at the lodge, spending time along the river bank enjoying the tranquillity of the area, or lounging at the swimming pool. After brunch and an optional village walk, we continue and venture eastward into the spectacular Makgadikgadi Salt Pans area. Besides the stark scenery, the pans are known for their prolific bird life and the other desert adapted animals. Without disturbing the surface, we make our way to a remote site where we set up camp and take in the isolation and serenity of this expanse. Although we set up tents, we encourage clients to enjoy a night out under the canopy of stars. With no other lights in the area, our private camping spot provides the perfect location for star gazing and our guides will take time to explain the constellations. As the stars dance above we drift away to sleep. Should the pans be inaccessible for camping we will make use of an alternative campsite in the area. Venturing north today, we leave the desolation of the pans behind and make our way up to the mighty Chobe River. The Chobe area is known for the huge herds of elephants and other animals that are attracted to drink from the river. Renowned for its Elephant herds, these majestic animals are known for the absolute gentleness and love of their young and affection for their herd. This afternoon we enjoy an extensive boat cruise within Chobe National Park. Gliding close to the banks we hope to approach the animals from the river for close up viewing. Our cruise will explore the Chobe riverfront and a section of the Namibian side of the Chobe River. Back on land, we cross the border into Zimbabwe and make our way to the GREENFIRE LODGE VICTORIA FALLS. The lodge is centrally situated and within walking distance of the falls and other attractions. Awaking in the adventure capital of Africa, it is with new excitement that we explore the amazing Victoria Falls. “Mosi o Tunya “, meaning “The smoke that Thunders”. On this day we include your entry into the falls and leave you to admire this wonder of the world. During our stay, various other attractions can be visited including, the tribal village, the big tree, the curio market and the crocodile farm. Vic Falls is also home to a multitude of adventure activities such as an aircraft flip over the falls or a boat trip on the Zambezi River, white water rafting or bungee jumping, but allowance must be made for the extra expense. We enjoy a relaxed breakfast at the lodge before we leave Victoria Falls behind us and make our way back to the bush. We travel the short distance to the renowned Hwange, well known as one of Africa’s best conservation areas and our base for the night. After an extensive open vehicle drive/walk, we camp at a remote camp overlooking a waterhole teeming with game. Today we travel south to the wide streets of Bulawayo; Zimbabwe’s second largest city. We then continue to the Matobo area where, in the afternoon, we enjoy a tour into the national park to view animals and track rhino through the bush on foot. Tonight our camp is situated amongst the balancing boulders of the Matobo Hills which, of course is where the local Matabele tribe helped bury the remains of Cecil John Rhodes, from whom Rhodesia originally derived its name. Continuing south today, we cross the border back into Botswana and to our bush camp situated on a private game reserve within the Limpopo valley. On arrival in the afternoon there will be time for a short walk in the surrounding bush. This morning we continue our journey and make our way to Johannesburg, the city of gold. We enjoy the scenic drive as we make our way to the end of the tour. The tour ends on arrival in the late afternoon at the GREENFIRE LODGE JOHANNESBURG. The Cape Town to Johannesburg Overland Camping Safari day by day descriptions published are intended as a rough guideline only. Adventure travel by nature is unpredictable, weather patterns, game migrations, road conditions and a multitude of other factors may necessitate itinerary changes that ultimately are for the client’s benefit. It is essential that clients are flexible and open minded in this regard. Please ensure that you are in possession of valid travel documents for all the countries, (Namibia, Botswana, Zimbabwe and South Africa) that you will visit. PLEASE NOTE THAT FOR SOME OF THESE COUNTRIES, CERTAIN NATIONALITIES NEED TO APPLY AND OBTAIN THESE VISAS PRIOR TO YOUR TOUR DEPARTURE AS SOME NATIONALITIES CAN NOT GET VISAS AT THE PORT OF ENTRY. PLEASE CONSULT YOUR TRAVEL AGENT WITH REGARDS TO VISAS THAT YOU NEED AND WHETHER OR NOT YOU SHOULD GET IT BEFORE YOU DEPART ON TOUR OR NOT. If you have any queries in this regard, please do not hesitate to contact us. Please ensure that you have proof of further travel arrangements if you do not have a South African passport, permanent residency permit, work permit or study permit. Although we will endeavor to assist, we do not accept any liability or obligation for your travel documents. 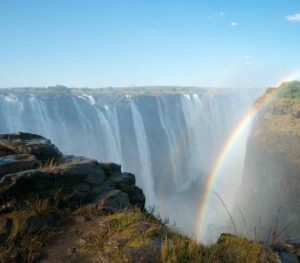 Zimbabwe/Zambia: Please inquire from your guide about the KAZA visa obtainable at the port of entry into Zimbabwe (this Visa allows you to enter Zambia as well if you should be interested. Please note that a Yellow Fever Certificate is needed to enter Zambia depending on nationality and prior travels. Make sure that your passport has at least six months’ validity from your planned date of return to your home country. Make two photocopies of valuable documents such as your passport, tickets, visas. Keep one copy with you in a separate place to the original and leave another copy with someone at home. Please note that all guests traveling to South Africa will require two blank facing pages in their passport. The Ministry of Nationality, Immigration and Gender Affairs informs the general public that it has imposed requirements for minors (children under 18) traveling through the country’s ports of entry. Effective from the 1st October 2016 minors traveling through the country’s borders will be required to produce certified copies of unabridged birth certificates in addition to their valid passports. In the event that one parent is not traveling with the child, the other parent’s affidavit consenting to such travel should be availed. However, an affidavit will not be required if the father’s name does not appear on the child’s birth certificate. The development, which is aimed at managing the movement of children across the country’s borders, has an ultimate goal of tackling human trafficking which is a global challenge. Botswana, like other countries is affected by this problem and as such has enacted the United Nations Anti-Human Trafficking Protocol; which calls upon governments to come up with deliberate measures aimed at combating human trafficking. PLEASE NOTE IT IS YOUR RESPONSIBILITY TO HAVE THE CORRECT TRAVEL DOCUMENTS (VISAS AND VALID PASSPORTS) FOR EACH AND EVERY COUNTRY YOU WILL BE VISITING ON YOUR TOUR. Credit cards are not favored in most parts of southern Africa so please ensure you will have enough cash to buy good and possible gratuities. The only necessary prophylaxis for southern Africa is against Malaria (Botswana and Zimbabwe). Adequate chemo-prophylaxis are essential. Prevention is better than cure, so we do advise to also use insect repellent on exposed areas after sunset. Please consult with your general practitioner regarding this. All Drifters guides have first aid boxes for use in emergencies, however we recommend that you bring along your own basic supply of medication, headache tablets etc. Please bring along any personal medication that you might need on your tour as specific medication could be difficult to find or might not be obtainable in most places we visit. General medication for headaches, colds and fever are easy to get. Please also inform your guide of any medical conditions. This information will be received professionally and kept confidential.